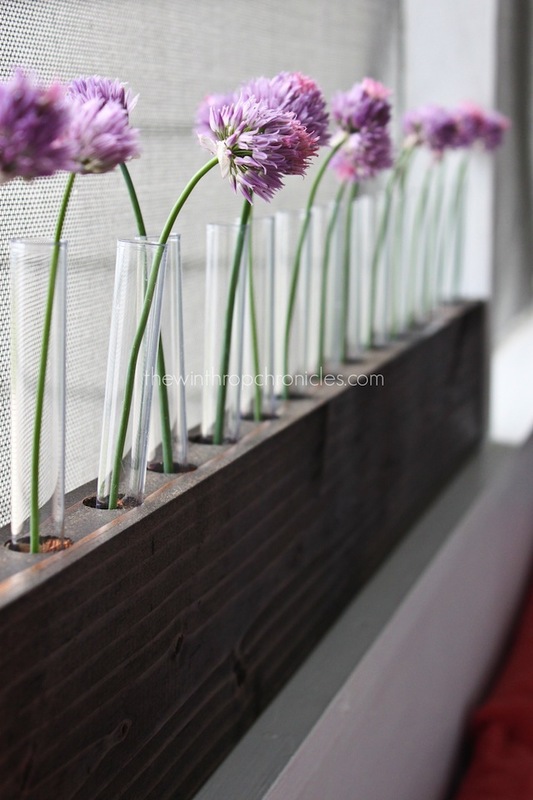 I wanted to make something to go on the windowsill on my porch and thought this test tube vase would work well. I could customize it to fit the exact space so I think it worked out perfectly. It is a great way to break up the space in the large open screened window. To make: Cut a piece of wood the size you like. Mine ended up being 2 x 5 x 35. I used a drill press and drilled the holes for the test tubes. Then I stained the wood. I bought the test tubes on Amazon for about $6. I used a dab of hot glue on the bottom of the test tube to make sure they stay in place. These flowers are actually blossoms from my chive plant and will dry very nicely. But I plan to switch them out with my daisies when they bloom. Maybe add in some billy balls and bring it inside for my dining room table in the fall.